The next Children’s Mass for children in second class preparing for their first Holy Communion will take place on Sunday February 19th, at 11.00am in Church of Christ Our Light. The Parents of children who are seven and eight are asked to bring them to this Mass. Preparation with the children commences in the main body of the church at 10.45am. Small children preschool/infants/1st class retire to the crying room where they celebrate the Liturgy of the Word in a child friendly fashion. They will return to the main church at the start of the offertory procession. Please keep to left hand side as you approach the car parks. This is important from a health and safety point of view. Please also be careful of pedestrians who walk to Mass or from their cars to the church. Take care also not to obstruct entrance and exit to the car parks and church doors. Please ensure that you do not obstruct residents’ entrances to their homes. Special Envelope Collection this weekend February 11th & 12th. This collection subsidise the Annual Diocesan Pilgrimage for individuals whose health/or means would otherwise prevent them from travelling to Lourdes. It also subscribes to medical expenses, travel and care personnel. Many thanks to the Parishioners who returned their CHY4 Cert for 2016. 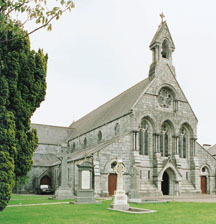 The parish, being a registered charity, is entitled to claim tax back paid by their donors. Thank you for your support and I look forward to your continued support. The next Baptism preparation will take place on Saturday 1st April at 12.00 noon in the Library Room, Community Hall, Station Road. The presentation lasts for approximately forty minutes. The following questions are addressed, What is Baptism? What are the symbols used in the Sacrament of Baptism? How can the family become involved in the ceremony? Parents might book the baptism a few weeks in advance to give ample time to take part in the preparation.